It's Thursday, y'all, and that means it's time for Thrifty Thursdays, a weekly book meme started by Sal over at Motion Sick Lit. He's pretty nifty; you should definitely check out his blog if you haven't already. As I mentioned before, my boyfriend's mom came for a long visit last weekend. After a delicious Mother's Day brunch on Sunday, she asked if we could go find something for her to read on the plane back to Oregon. (Did I mention that I love my boyfriend's mom?) She specifically requested a used bookshop, so we took her by The Book Trader Café, a local shop specializing in cheap reads and good eats. Of course, I couldn't pass up a chance to grab a new book or two myself. I found Murder on the Orient Express by Agatha Christie for a mere $1.50 on the clearance cart outside. I read my first Christie, And Then There Were None, late last year and wasn't overly impressed. 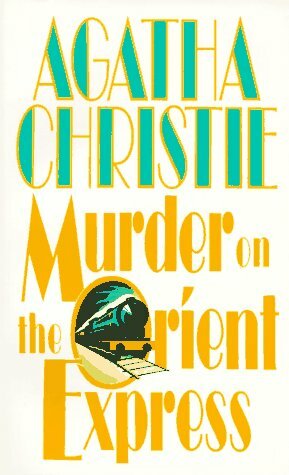 Besides ATTWN, Murder on the Orient Express is the book I see recommended most often for people new to Christie's work. Given her status as a whodunit juggernaut, I'm excited to give her writing another chance. My boyfriend's mom was also excited by my selection; she told me that she loves cozy mysteries best when she's sick or otherwise bed-bound. Seeing as I've been sick twice in the last month, I'm hoping I won't have an occasion to read this one anytime soon. Sorry, Aggie. Have you found any super cheap reads lately? Be sure to let me know in the comments and link up on Sal's page! I am afraid to say I don't think I've read any Christie. I should remedy that some day! I hope you enjoy this one more though! Thanks for the kind shout-out. I've never actually read any Agatha Christie...I find there's a pretty large list of authors that I've thus-far escaped for one reason or another...Agatha Christie, Stephen King, Virginia Woolf, to name a few. I think Murder on the Orient Express is supposed to be pretty good, though. I think this happens to all of us. I've never read any King, either, nor any Austen or Brontë(s)! I hope to rectify this through the Classics Club. Me too! The premise sounds promising.